Neil D. Opdyke (February 7, 1933 – April 7, 2019)  was Distinguished Professor Emeritus in the Department of Geological Sciences at the University of Florida in Gainesville, Florida, USA. He was previously with Lamont-Doherty Geological Observatory of Columbia University, including a stint as Director. He is well known for his groundbreaking research in the 1950s on paleoclimate and continental drift, with Keith Runcorn, and later in Africa and Australia with Mike McElhinny  and others. Back the US in the mid-1960s he worked on the documentation of magnetic reversals in deep-sea sediments, which led to proof of the Vine–Matthews–Morley hypothesis the governing paradigm for marine magnetic anomalies. (Stanley) Keith Runcorn was a British physicist whose paleomagnetic reconstruction of the relative motions of Europe and America revived the theory of continental drift and was a major contribution to plate tectonics. In 1969, Dr. Opdyke & Ken Henry used marine core data for a convincing test of the GAD hypothesis that is central to the use of paleomagnetism in continental reconstruction. Opdyke’s work with Nick Shackleton in 1973 marked the beginning of the integration of oxygen isotope stratigraphy and magnetostratigraphy that has led to current methods of tuning timescales. Neil pioneered magnetic stratigraphy in terrestrial (non-marine) sediments and produced some of the most impressive records, notably from Pakistan and southwestern USA. These studies led to a vastly improved time frame for vertebrate evolution and allowed the documentation of mammal migration. 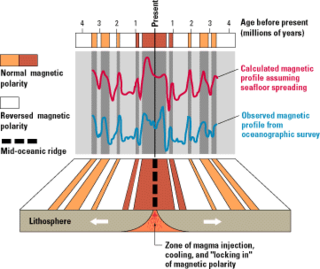 Paleomagnetism and its application to tectonics and magnetostratigraphy. Paleoclimatology and paleogeography of the Phanerozoic. Allan Verne Cox was an American geophysicist. His work on dating geomagnetic reversals, with Richard Doell and Brent Dalrymple, made a major contribution to the theory of plate tectonics. Allan Cox won numerous awards, including the prestigious Vetlesen Prize, and was the president of the American Geophysical Union. He was the author of two books on plate tectonics and over a hundred scientific papers. On January 27, 1987, Cox died in an apparent suicide. Sir Nicholas John Shackleton FRS was an English geologist and paleoclimatologist who specialised in the Quaternary Period. He was the son of the distinguished field geologist Robert Millner Shackleton and great-nephew of the explorer Ernest Shackleton. Edward A. "Ted" Irving, was a geologist and scientist with the Geological Survey of Canada. His studies of paleomagnetism provided the first physical evidence of the theory of continental drift. His efforts contributed to our understanding of how mountain ranges, climate, and life have changed over the past millions of years. Walter Clarkson Pitman III is an American geophysicist and a professor emeritus at Columbia University. His measurements of magnetic anomalies on the ocean floor supported the Morley–Vine–Matthews hypothesis explaining seafloor spreading. With William Ryan, he developed the Black Sea deluge theory. Among his major awards are the Alexander Agassiz Medal and the Vetlesen Prize. 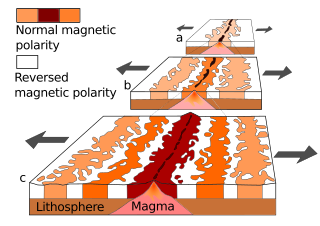 Magnetostratigraphy is a geophysical correlation technique used to date sedimentary and volcanic sequences. The method works by collecting oriented samples at measured intervals throughout the section. The samples are analyzed to determine their characteristic remanent magnetization (ChRM), that is, the polarity of Earth's magnetic field at the time a stratum was deposited. This is possible because volcanic flows acquire a thermoremanent magnetization and sediments acquire a depositional remanent magnetization, both of which reflect the direction of the Earth's field at the time of formation. This technique is typically used to date sequences that generally lack fossils or interbedded igneous rock. Rashid Ahmed Khan Tahirkheli was the vice-chancellor of Gandhara University. Prior to his appointment he was Director of the Geology Department and ex Vice-Chancellor at Peshawar University. He was also Professor Emeritus in the National Centre of Excellence in Geology, University of Peshawar. His scholarly reputation rests on his contributions to the Geology of the Himalayas, Karakoram and Hindukush. He received prizes including Sitara-i-Imtiaz in 1982. Miriam Kastner is a Bratislavan born American oceanographer and geochemist. Kastner is currently a Distinguished Professor at Scripps Institution of Oceanography at the University of California, San Diego. Wolfgang "Wolf" Helmut Berger was a German-American oceanographer, geologist, micropaleontologist and emeritus professor at the Scripps Institution of Oceanography, University of California, San Diego. His research interests comprise "micropaleontology, marine sedimentation, ocean productivity, carbon cycle, ocean history, climate history, and history of oceanography." Anthony Brian Watts FRS is a British marine geologist and geophysicist and Professor of Marine Geology and Geophysics in the Department of Earth Sciences, at the University of Oxford. Sampat Kumar Tandon is an Indian geologist and a professor emeritus of geology at the University of Delhi. He is a former pro-vice chancellor of Delhi University, Sir J. C. Bose Chair Professor of the department of Earth and Environmental Sciences at the Indian Institute of Science Education and Research, Bhopal and a D. N. Wadia Chair Professor of the department of Earth Sciences at the Indian Institute of Technology, Kanpur. Kolluru Sree Krishna is an Indian marine geophysicist is the chief scientist at the National Institute of Oceanography, India. He is known for his studies on the evolution of the Indian Ocean and is an elected fellow of all the three major Indian science academies viz. Indian National Science Academy, Indian Academy of Sciences, and the National Academy of Sciences, India. The Council of Scientific and Industrial Research, the apex agency of the Government of Indvia for scientific research, awarded him the Shanti Swarup Bhatnagar Prize for Science and Technology, one of the highest Indian science awards for his contributions to Earth, Atmosphere, Ocean and Planetary Sciences in 2001. James Zachos is an American paleoclimatologist, oceanographer, and marine scientist. He is currently a professor and chair of the Department of Earth and Planetary sciences at University of California, Santa Cruz where he was elected to the National Academy of Sciences in 2017. He has conducted research on a wide variety of topics related to biological, chemical, and climatic evolution of late Cretaceous and Cenozoic oceans, and he is recognized for transforming our understanding of long-term climate change and climate transitions in the past 65 million years. His investigations of past climatic conditions are intended to improve our ability to understand the consequences of anthropogenic carbon emissions on future climate change. David Gubbins is a retired British geophysicist concerned with the mechanism of the Earth's magnetic field and theoretical geophysics. He is Emeritus Professor of Earth Sciences at Leeds University. Lisa Tauxe is a geophysicist, professor and department chair at the Scripps Institute of Oceanography at UC San Diego. Tauxe is a researcher and international authority on the behavior of the ancient geomagnetic field and applications of paleomagnetism to geological problems. Leigh "Wiki" H. Royden is an American geologist. ↑ "Australian Academy of Science". Australian Academy of Science. Archived from the original on 15 August 2014. Retrieved 14 August 2014. ↑ "Awards & Medals; Petrus Peregrinus Medal 2008". European Geosciences Union. European Geosciences Union. Retrieved 14 August 2014. ↑ "1996 John Adam Fleming Medal Winner". American Geophysical Union. American Geophysical Union. Retrieved 14 August 2014.